The shops on Ibiza are relatively diverse in both product range and appearance. Inspired by the hippie and clubbing cultures prevalent throughout the island, Ibiza boasts its own fashion label, Ad Lib, characterised by stylish white flowing garments. For the designer labels and fashionable accessories, head to Ibiza Town where small boutiques line its narrow streets of Sa Marina and Dalt Vila. Everywhere you look you will see evidence of Ibiza’s influences, from island-made jewellery to unique club wear. Shops tend to close between 2pm and 5pm for siesta but are generally open until 10pm. 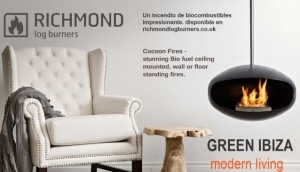 Whether your home is a small apartment, an old finca or a large, modern villa, Richmond Log Burners has the perfect fire to keep you and your family cosy all winter long.